Many of my friends looking for way to convert .doc file to pdf file in win xp. Let me share a free software that able to convert doc file to pdf file – PDFCreator. 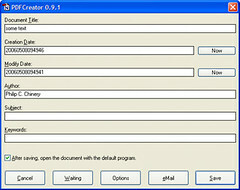 PDFCreator work as a printer driver to convert doc file to pdf file. First, download PDFCreator from here and install it. Once you install PDFCreator, it will prompt your for a system restart, just restart your PC. After the restart, open your doc document using Microsoft Word or your normal document program. Done, PDFCreator has convert your doc file to pdf file. * The original doc file is unchanged.